Social Security payments are a staple of many retirees in the US. The monthly check may be the only source of income. For others, it may supplement a pension, savings, a tax-deferred savings plan such as a 401-k plan, or investment income. This post provides some insight into how Social Security reached its present condition, and dispels some common misconceptions. The agency was created in 1935 to provide "old age benefits" for the elderly. The system works today by collecting a percentage of most workers' paychecks (not all workers, though), and disbursing monthly payments to eligible persons, mostly retirees. One of the commonly held beliefs is that Social Security does not pay back the money a person paid in during his working life. That belief may be true, but then again it may not, depending on circumstances. More on this below. At first, the number of people paying into the system was much, much greater than those on the receiving end. Only a small percentage was required from each worker's paycheck. Under the system today, the employer contributes 7.65 percent of the gross pay, and the employee also contributes 7.65 percent for a total of 15.3 percent. There are annual limits to how much the government collects from each person, with the compensation amount for 2015 set at $118,500. Fifteen-point-three percent of $118,500 is then $18,130 paid into Social Security. However, a small portion of this now goes to Medicare, so that Social Security actually receives 6.2 percent from each of the employee and employer. Note, for additional detail, the 1.45 percent for Medicare applies to all earnings. To make the system somewhat easier to follow, the remaining part of this article uses 15 percent. For a person who has earned and still earns the maximum annual income, and is due to retire in 2016 at age 66, one can determine the amount he would have paid into Social Security as 45 years of working (age 22 through age 66) and beginning salary of $17,700 and final salary of $118,500 in 2016. For simplicity, the calculation assumes a linear increase in salary over the 45 years, and the average salary was $61,000. The total amount paid into Social Security was $413,700. The maximum monthly payment to the retiree in 2016 is $2,663, with the annual amount of 12 payments at $31,956. To recover all of the money paid in, the retiree must collect for 12.9 years, or to age 79. Should he live longer, he collects more than he paid in. This is based on no interest on any of the funds. The same is true, essentially, for the retiree who elects to retire early at age 62 or at the older age of 70. He collects a lower monthly amount at 62, but breaks even at age 79. Therefore, it can be seen that a person will not receive back the money he paid in if he dies before age 79. In the US, mortality statistics show that only approximately 83 percent of those who are soon to retire reach age 62, and only 78 percent reach age 66. 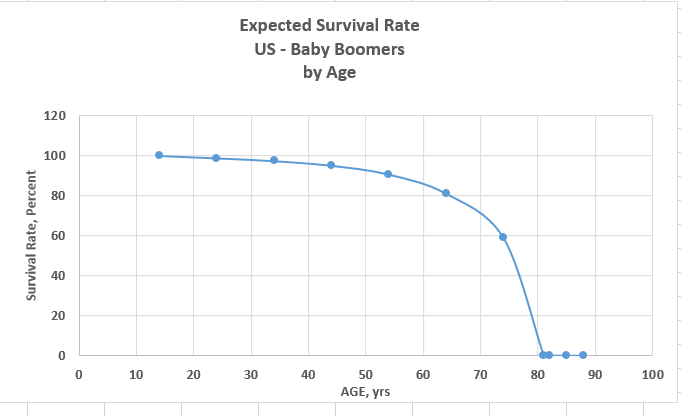 More importantly, almost the entire cohort of the current group, the Baby Boomers, are expected to die by age 80. Only approximately 1 or perhaps 2 percent will live to age 80 and beyond. The 20 percent (roughly) that paid into the system but died before age 66 will not receive any money. However, there is a provision for widows and widowers to receive money based on a deceased spouse's earnings. Also, unlike a private investment, social security payments to do not flow into the deceased's estate for distribution to heirs. The chart below shows the expected survival rate of Baby Boomers, by age. The graph is interpreted as having 100 people alive at age 14. Then, at every subsequent age, one can determine the number of people still alive. This includes deaths of all causes. The curve is the average of all persons, including male and female, and all races. As is widely known, women live slightly longer than do men, and whites live slightly longer than do blacks. Asians live slightly longer than do whites. Reasons for these disparities in longevity are written about extensively in various literature sources. One of the issues with Social Security is the large cohort of Baby Boomers that will retire over the next 10 to 15 years. The assertion is that too many people will be collecting Social Security relative to the number of people in the workforce that are paying into the system. How does one create more people working, to pay into the Social Security system? Many policy decisions in the past have worked against such an outcome. High wages, in part driven by organized labor and in part driven by government minimum wage laws, led to manufacturing in overseas factories where labor rates are lower. One has only to remember, or perhaps look up, the unions that held strikes over increased wages. This ultimately led to fewer jobs in the US. Also, higher wages and reduced costs of some forms of manufacturing led to jobs lost to automation. An example that is on almost every street corner is the loss of bank teller jobs, as automated teller machines, ATMs, were placed on sidewalks and in businesses. Many, many other jobs also were replaced by automation, such as robotic welding machines in manufacturing. Another way that jobs were lost is from excessive environmental regulations, such as the US EPA and state agencies. Where possible, many companies moved their manufacturing to other countries where investment in pollution reduction equipment is not required. The US lost those jobs, likely forever. The above shows three reasons for fewer US workers: high wages, automation, and environmental regulations. To create jobs lost by the above, policies must either change, or some form of job creation must be found that is not subject to those policies. However, there are also reasons why Baby Boomers live longer than previous generations and live to receive Social Security benefits. The trend in longevity has increased for many years. One reason for longer lives is the reduction in tobacco smoking, which smoking is known to cause deadly cancers and other illnesses that lead to early death. Better nutrition and exercise also contribute. Improved medical science also contributes to longer life, especially the ability to detect and treat or cure some forms of cancer. Also, Baby Boomers enjoy a safer society in many ways. Automobiles with seatbelts and airbags, and the very design of cars that makes them safer are two such ways. The interstate highway system, with its separation of traffic, also makes driving much safer. Before the interstates existed, city-to-city travel was via two-lane highways in many areas. Passing a slow vehicle required pulling into the on-coming traffic, rapidly increasing the car's speed, then pulling back into the proper lane. Many accidents and deaths resulted. Finally, the last example is probably controversial at this time in the nation's history with gun violence and gunshot deaths in the news almost daily. However, the FBI's national murder rate statistics show 5.02 murders per 100,000 population in 1960, compared to 4.39 per 100,000 in 2014. We live in a slightly safer world. The best way to get back the money one paid into the Social Security system is simply to live past the age of 80. Should enough people actually accomplish that, by whatever lifestyle modifications they adopt, government will make funds available to meet the obligations. Baby Boomers, in particular, have voted and will likely continue to vote on such issues until there are simply too few left to matter. That "won't matter any more" date is likely only 20 to 25 years away, given the above statistics on survival rates and age. After that time, the year 2035 or 2040, Baby Boomers' demise will have other far-reaching impacts on the US, but that is a topic for another time. copyright (c) 2016 by Roger Sowell - all rights reserved.